Girl Fight Wrestling has granted Eat Sleep Wrestle total access to the roster for its second midnight show, Midnight Girl Fight 2: Howdy, Pilgrim! Today is part six of this series, featuring Billie Starkz. There’s something different about Billie Starkz, something you just don’t see often in independent wrestling. Although she only made her debut in October, the young star has her own quirky approach to life and to wrestling. She grabbed a lot of people’s attention a few weeks ago on social media, when she stole fellow Grindhouse Academy product ZDP’s prized “Top of the Class” plaque and paraded it around town for a week. And she certainly got my attention when, unlike any other member of the Girl Fight roster, she submitted the answers to her interview written on paper from a wide ruled notebook. I beg to differ, Miss Starkz. I’ll be up at 9 am to watch the Macy’s Parade and start prepping my sides for the family dinner. But that won’t stop me from being at the Arena to see how you fare against Samantha Heights. Fans can see Billie and more at Midnight Girl Fight 2 on November 21 at the Arena in Jeffersonville, Indiana, 1416 Spring Street. Bell time is at 11:59 PM. Girl Fight Wrestling has granted Eat Sleep Wrestle total access to the roster for its second midnight show, Midnight Girl Fight 2: Howdy, Pilgrim! Today is part five of this series, featuring Amazing Maria. Fans who have attended multiple Girl Fight Shows are familiar with Amazing Maria. Once known as the Most Hated Woman in Wrestling, Maria has become one of the top fan favorites in the company. She’s outstanding singles matches and some fantastic tag matches with partner Samantha Heights, but her status change with the fans hasn’t chanted her a bit. Fans can see Amazing Maria and more at Midnight Girl Fight 2 on November 21 at the Arena in Jeffersonville, Indiana, 1416 Spring Street. Bell time is at 11:59 PM. Girl Fight Wrestling has granted Eat Sleep Wrestle total access to the roster for its second midnight show, Midnight Girl Fight 2: Howdy, Pilgrim! Today is part three of this series, featuring Piper Brooks. To many wrestling, fans, an all-women’s show is a gimmick in itself. Never mind that there are a number of great all-women’s promotions who have put on hundreds (yes, WWE, hundreds) of all-women’s pay-per-views. To some fans, it’s novelty enough in itself. Girl Fight likes to push the boundaries of how people view women’s wrestling. Not only are they running their second midnight show, this one features a match with a no disqualification, falls count anywhere stipulation between two very brutal, hard-hitting women. Girl Fight Wrestling has granted Eat Sleep Wrestle total access to the roster for its second midnight show, Midnight Girl Fight 2: Howdy, Pilgrim! Today is part two of this series, featuring Charlie Kruel’s opponent for the event, Hayley Shadows. MJF vs. Teddy King – Who Is Better Than Whom? MJF believes he’s better than you. His T-shirt says it. He says it in the ring. He’s arrogant, he’s cocky, and right now, he has the CZW Heavyweight Title to back it up. 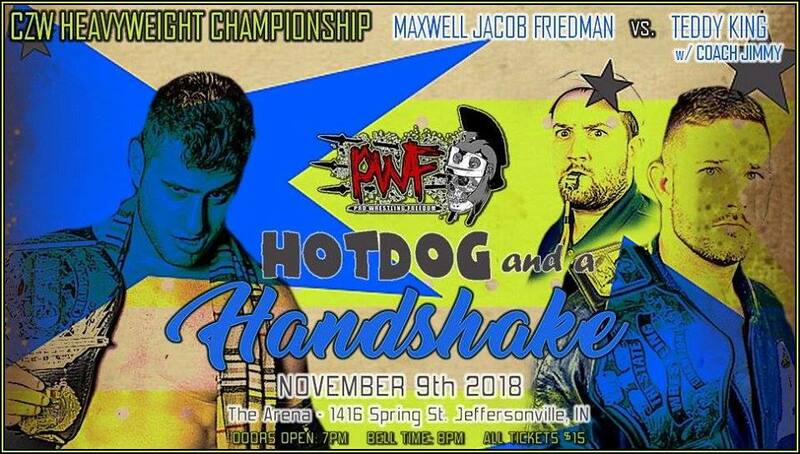 He also has a date with the equally arrogant, cocky, and verbose Teddy King of Owensboro this Friday night at Pro Wrestling Freedom, and the two may very well fill the Jeffersonville Arena with enough hot air to make the building float away. MJF vs. Teddy King happens Friday night at Pro Wrestling Freedom. Bell time is at 8 PM at the Arena in Jeffersonville, 1416 Spring Street. Billie Starkz has only been a wrestler, officially, less than a month, but Grindhouse Academy product is selling her feud with Zach Pittman better than WWE sells its current product. At Sunday’s Grindhouse show at the Jeffersonville Arena, she managed to sneak away with a prized plaque that belongs to Pittman, and ever since, she’s been taunting him with photos of the plaque on social media. The plaque has been used as a footrest, attended classes, and had many adventures in the past few days. It’s been fun to watch, and the week has only just begun. Independent wrestlers today are small businesses. They are their own brand managers, and those who learn how to market themselves well will go far. It’s still very early in her career, but I think Billie Starkz has a bright future in this business. You can catch Billie in action every Sunday at 2 PM with Grindhouse Pro Wrestling at the Arena in Jeffersonville, 1416 Spring Street. 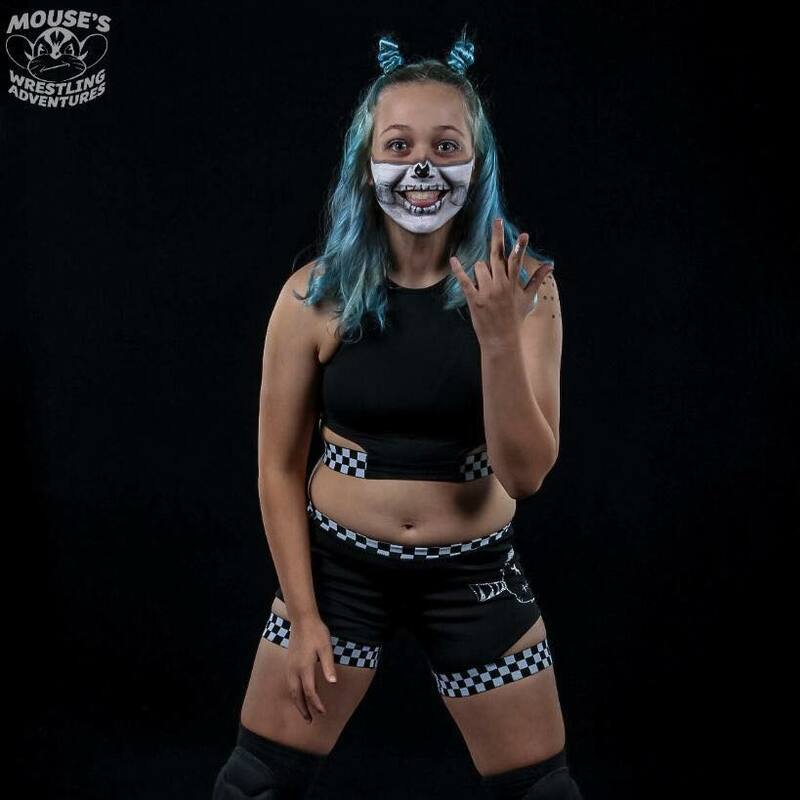 Billie will also make her debut with Girl Fight Wrestling at their next Midnight Girl Fight show. Bell time is 11:59 PM on Wednesday, November 21, the night before Turkey Day.